That's a lot of squirrels. A former research assistant recently sent me this photo, mentioning that she had deliberated in the store for 10 minutes (!) 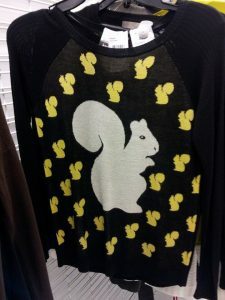 about whether or not she should get this amazing squirrel-covered sweater for me. When I saw the photo, I have to admit a longing to own and wear this sweater... and I considered rushing to the store to try to find it. This led me to thinking about my life as an animal-obsessed person. 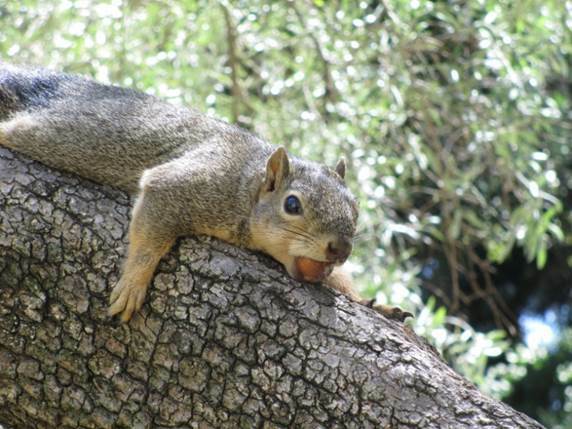 As a researcher and consultant, I have worked with pigeons, squirrels, and cats. And in my lifetime, I have received numerous gifts and tchotchkes with the aforementioned animals emblazoned on them, and they are always much appreciated. Posted in other important things. Tags: cats, clothing, research subjects, squirrels on December 9, 2013 by Mikel Delgado.